About 8 years ago, I had an eye-opening experience. I weighed almost 300 pounds and was diagnosed with hypoglycemia. I was told if I didn’t do something about my weight, that it could turn into diabetes. I’m about 6’5″ tall, so I didn’t look extremely obese, but my BMI was in the obese category. Over the past 8 years, I’ve tried a few things to lose the weight and today, I weigh around 270 LBS. Now, that’s not a drastic weightloss, but I have been working on changing my lifestyle rather than just losing the weight. At one point, I was down to about 250 LBS. One of the first diets I tried was the Atkins Diet. I only did it for about two weeks, but I lost over 20 LBS. My dad and half-sister both have been on that diet and saw results. I know a lot of people out there will say how unhealthy it is for you, but it actually does work as long as you’re strict about it. Its a drastic diet where you cut out almost all carbs in the first two weeks and you eat almost all protein (meat, eggs, etc). You also want to eat fatty proteins, like beef. Once your body gets into Ketosis, you’ll start losing weight because your body is burning its own fat since you’re restricting the carb intake. I also got a lab mix puppy, Champ, and I would go jogging with him for exercise. I used to play basketball in middle school and high school, and after I stopped the extreme exercises, I started to gain weight. I did things like Slim Fast, watched what I ate (similar to Atkins, I would limit my carbs and up my protein, just not to the extreme). I tried the P90X workout videos and Insanity from BeachBody. Fast forward to today. My wife and I are both still considered overweight or obese, so we decided to start this journey together. We joined a local LA Fitness and have been going 4-5 times per week for over 6 months. I haven’t been as strict with my diet as she has, but I’ve been trying to limit my carbs still, but I’ll still cheat. For me, exercise is a big key to being successful. I need something to motivate me. I’ve been doing a mixture of cardio and weight training at the gym, so I might not see the results as fast on the scale, I know I’m gaining muscle and losing fat, and I can see the difference in the mirror. I’m not a big supplement guy, but I try to have a protein meal replacement shake in the morning, then a protein isolate shake after an intense workout. Most of my weight is in my stomach, and while I’m not seeing overnight results, I’m proud of the progress I’ve made so far. I can now run on the treadmill, do the elliptical, or the stair climber machine. When I started, I was lucky to be able to run 2 minutes on the treadmill before losing my breathe. Now I can easily do 1-2 miles. Every year, Elgin has a Fox Trot race, and my wife and I plan on entering it next spring. They have 3 races to choose from – a 10 mile run, a 5k run, and a 2mi walk. I’m not sure which one we’ll do, but it is a goal we’ve set for ourselves. 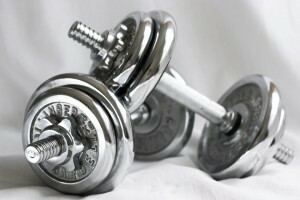 I plan on expanding my personal fitness knowledge and finding more ways to improve my health and stay healthy. If you have suggestions, please post them in the comments.